When it comes to optimising your website for search engines, there’s often lots of talk about selecting the right keywords, using structured header tags and crafting compelling page titles, but the impact of meta descriptions for SEO is often overlooked, and can’t be overstated. A meta description is a short snippet of text that summarises a web page’s content on search engine results pages. The purpose of a meta description is simple: to entice users into clicking through to your site. If you were asked to stand up and ‘sell’ the page for 15 seconds, that’s what you need to include in a meta description. Many site owners overlook meta descriptions without realising the impact they can have. A snappy, actionable meta description can provide a positive first impression, so it’s important to get it right. Search engines say that meta descriptions provide no correlation for where your site appears on results pages, but there is an indirect benefit: search engines tend to use click-through rates as a means of working out whether your site is a good match for the searcher’s query. The more users click through to your site from search, the higher you’ll appear on results pages for certain terms. Below we’ve listed 8 easy ways you can optimise your meta descriptions to ensure searchers click through to your site. You should use meta descriptions to faithfully reflect the content searchers will eventually click through to. Search engines are pretty nifty at sifting out misleading descriptions, and will penalise you for doing so, so don’t try and beat the game. Whether they’re looking to make a booking, enquire about a service or complete a purchase, people tend to visit search engines looking for an answer to their question(s). Try and place yourself in the searcher’s shoes and think about what they need to know to solve their problem. Your meta description should reflect your organisation’s identity and provide enough detail to answer their question and impart value so that they click through to your site. A meta description that evokes a reaction, whether that’s urgency, trust or curiosity is likely to be more effective in persuading users to act. Detail the things that you’d expect searchers to want to see, and be sure to highlight any differentiators to help you stand out from the crowd. If you’re responsible for an e-commerce site, focus on the technical and financial aspects of the product – manufacturer, SKU, unbeatable price etc. If a searcher is looking for a product that you sell, and your site appears at the top of the results page, you shouldn’t have to work too hard to convince them to click through – compelling information like the price and how quickly you can get the item to them go a long way. Calls-to-action are powerful because they communicate purpose and urge searchers to progress to the next step. Clearly state the benefits of clicking through to make better use of this space. There is no sweet spot for meta description length, but it’s generally safe to stick to somewhere between 130-160 characters. Depending on the device the searcher is using, search engines may trim descriptions to fit their screen size, so don’t exceed that number. Don’t fall into the trap of reusing meta descriptions – each page on your site is unique, so don’t copy and paste descriptions. If more than one page on your site shares the same description, then they will compete with each other and send search engines the wrong signals, which can hamper your efforts. If you don’t know whether or not your site suffers from duplicate meta descriptions, use Google’s Search Console to check. Choosing relevant keywords is one of the most important steps for SEO. If the searcher uses your keywords, the more inclined search engines will be to surface your site and display it on results pages. That being said, stuffing your pages with keywords won’t gain you instant results – quite the opposite, in fact. It’s important to consider the text to keyword ratio and strategically place them in content and other areas to truly make a difference. If your site is powered by WordPress, the Yoast SEO plugin provides an effective way of managing your SEO efforts. You can preview your meta descriptions in the Snippet Editor before publishing, so you’ve got a firm idea of what will be displayed on search engine results pages. If you don’t use WordPress, or any other content management system with an SEO extension, then try the Google SERP Simulator. Have you noticed that some sites have links, reviews and ratings in their results page listings? Those are rich snippets. Rich snippets contain structured data to provide more information to search engines, helping searchers to make better decisions before clicking through. 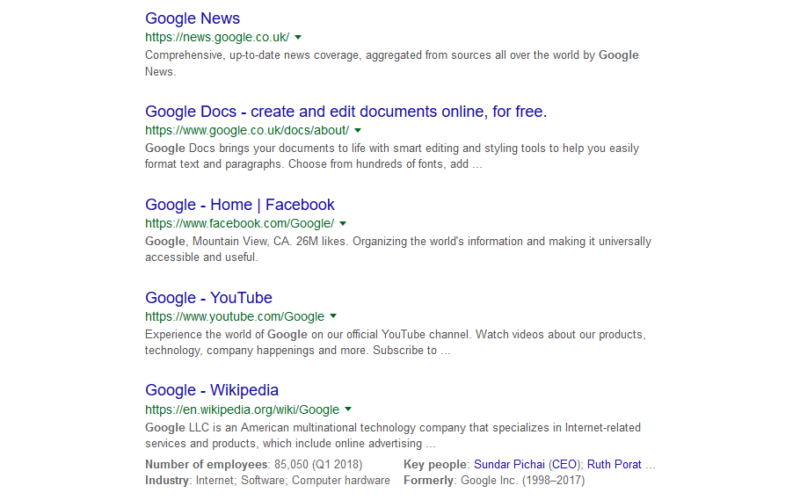 For more information on rich snippets, follow Google’s best practice guidelines. Search engines care about the experience they provide for searchers, and you should to. Meta descriptions exist to give them a better understanding of content and help them to decide which result best suits their needs. Without meta descriptions, you invariably weaken your ability to drive users to your site, and why would you want to do that?